I was reading through one of my martial arts group news feeds the other day on Facebook, and I stumbled across a question posed by one of the members. The question was based on the fact that, as we all know, a block is not a block, but rather a receiving technique. With this in mind, he questioned the application of blocks and their ability to serve as deflection techniques, and moreover how the rotation of the wrist at the actual point of impact plays this role. I was reading through one of my martial arts group news feeds the other day on Facebook, and I stumbled across a question posed by one of the members. The question was based on the fact that, as we all know, a block is not a block, but rather a receiving technique. With this in mind, he questioned the application of blocks and their ability to serve as deflection techniques, and moreover how the rotation of the wrist at the actual point of impact plays this role. To address this question, I would like to discuss the application of the wrist rotation in blocking and how we can leverage this rotation to control an opponent during a blocking technique. Quite often, when people block a limb that is coming toward them, they simply drop the bony inner or outer side of the forearm into the oncoming limb in the hope that they hit it at the correct angle so as to smash the attacking limb to the side. While this method can be effective, it can also be very painful to the novice and can result in nerve damage that will accumulate over your lifetime of training. The application of impact bone-on-bone blocking like this can be a useful tool in the karate practitioner’s arsenal, but it should not be the only option. One simple alternative is to make use of the natural wrist rotation that is present in many blocking techniques. For example, when you execute a downward block, the load or preparatory position requires the blocking hand to be in a high position right next to the ear. Turn the palm so it is facing the ear (as if you are going to grab it). As you execute the block, the arm straightens, and at the very end of the block, the wrist rotates outward so the palm finishes the block facing downward. Depending on your intent, the block can be rotated so it is in the final position before contact with the attacking limb (so as to smash it bone on bone), or it can be rotated so that the rotation happens at the moment of impact. This rotation allows for a greater degree of control of both the attacker and the defender’s own limb. This control is not possible otherwise. We will take a closer look at it here. Before we can go further in our discussion, it is important that we think about the shape of the wrist. For most people, the wrist is not round but rather an oval shape with a skinny side and a wide side. The orientation of the wrist determines its width. For example, if you turn your hand and look at your palm, you notice that your wrist is wide. Next rotate your hand ninety degrees so it is on edge. The wrist is now skinny by comparison. This oval shape allows for some interesting biomechanical leverage in terms of blocking techniques. First, it must be understood from basic physics that when you hit a target, the hardest way you can hit it is perpendicular to the striking surface. This certainly has its advantages when the attacker is hitting an object in a punch or strike; however, if you are deflecting or smashing the attacker’s oncoming limb, this is absolutely not what you want to do when blocking. For example, if you lean forward when conducting a downward block to block a kick, you increase the chance of having the shinbone hit the forearm at a ninety-degree angle. Because the shinbone is much harder and bigger than the forearm, the chance of damaging, or even breaking, the forearm is greatly increased. Therefore, it is vital that you intercept the technique at least at a forty-five-degree angle so the forearm does not have to absorb the full impact of the blow. This greatly lessens the force that the forearm or wrist needs to absorb and therefore lessens the chance of injury to the forearm. The next step is to use wrist rotation to help with the deflection. This concept is to meet the wrist so that the wider part of the wrist (associated with the front of back of the forearm) meets with the attacking limb. At that instant, the elbow locks into its final position, and simultaneously the wrist rotates so the skinny part of the wrist is now in contact with the attacking limb. This has the major effect of deflecting the attacking limb off course by a few degrees. These few degrees are enough to deflect the limb out of harm’s way. 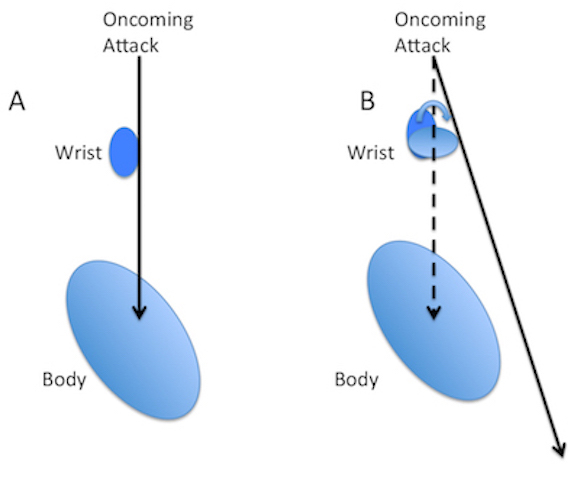 Figure 1: The effect of rotating the wrist on the oncoming attack. A: Starting position. The dark blue small oval represents the wrist, the large oval represents the body. The black arrow represents an oncoming attack. B: by rotating the wrist clockwise at the correct time (light blue oval) the oncoming attack can be deflected so that it misses the body. Compare the original vector of the attack (dashed black arrow, vs. the final defected attack vector, solid black arrow). This motion has a great deal of leverage associated with it. You can test this by having a partner lock out a punch. Then take up the final position of outside-to-inside forearm block (soto ude uke). Now use the block to try to shift the punch using just the shoulder. This should be fairly difficult. Next, try locking the elbow into position and moving the hips, arm, and shoulders as a single unit. This should be a lot easier but still difficult. Finally, rest the fat part of your wrist (palm side) on the attacking limb. Now rotate just the wrist clockwise so the fist faces you. The arm will shift to your right seemingly without effort, and if you are in the half-face position engaging both your back and chest, the arm will be deflected past your body. Additionally, you can manipulate your opponent into a disadvantageous position by using the wrist rotation effectively. If the rotation is done in the same direction as the oncoming limb, you can “drag” the opponent past you. For example, if you are standing with the left hand forward and your left hand is blocking a stomach punch coming from the attacker’s right hand using outside to inside forearm block (soto ude uke), the wrist should rotate clockwise, effectively “pulling” the opponent past you as the block is executed. As a general rule, you want the rotation of the blocking limb to match the direction of the attacking limb, thereby seemingly pulling the attacking limb along its path. There are exceptions to this—for example, if I step forward into an opponent and want to jam his punch at the elbow using a downward block. But normally, it’s much easier to deflect a punch by rotating in the direction of the oncoming limb. For example, if you have your body shifted to a forty-five-degree angle to the left of an oncoming right-handed straight punch to the stomach, you would move to the opponent’s closed side. If the body shift results in the left foot being in front, then you want to use an outside-to-inside forearm block (soto ude uke) (Figure 2, Top). This will initially touch the opponent with the wider palm side of the wrist. On impact, rotate clockwise to the skinny side of the wrist (the pinkie side). Figure 2: The choice of block differs depending on the choice of leg forward in the final position. In the top row, the left leg remains forward in the final position as the body rotates clockwise. The correct block would be soto ude uke (outside to inside forearm block). In the bottom row, the right leg is forward in the final position due to a shifting motion. Note that the block changes to soto ude uke (inside to outside forearm block). Note that in both cases the wrist contacts with the wide side of the wrist and rotates to the skinny side aiding in the deflection. However, if the body shift results in the right foot being forward, then you would want to use an inside-to-outside forearm block (uchi ude uke) (Figure 2, Bottom). With this block, the wrist will initially touch the attacking limb with the wider backhand side. Then rotate counterclockwise during impact to the skinny thumb side. Note that the wrist rotation in uchi ude uke, in this case, is in the opposite direction of the oncoming limb, but the movement of the block matches the direction of the attacking limb. This results in an overall deflection past vector. Finally, when we determine the axis of rotation during the impact phase of the block, we can control the body center, and thus how the opponent reacts. One of the tenets of Shotokan karate is that the hips rotate into a half-face position during the blocking technique. This allows the elbow to connect to the body in the position that allows the back and chest muscles to lock the humerus (and thus the elbow) in place. This final elbow position for many of the stomach blocks is one fist’s width from the side of the body, where the arms naturally hang when relaxed. When the hips turn, you can use several axes to achieve this rotation. The first is to rotate through the blocking hand (front) hip. This has the effect of moving the body center backward. The second is to rotate using the spinal column as the axis. This results in neither forward nor backward motion of the body center. The final way is to rotate through the rear hip. This has the effect of moving the body center forward. By taking advantage of the hip and wrist rotation, you can deflect an opponent past you, to the side, or backward. This allows you to set up the attacker at the correct distance and placement for an efficient and powerful counterattack. Hopefully, through the course of this discussion, I have convinced you to experiment with rotating the wrist when blocking. Intercept with the wider side of the wrist, and rotate to the skinny side during impact. By using this method, you can develop strong, well-timed blocking techniques to deflect an opponent’s attack, lessen the chance of damage to your own blocking limb, and simultaneously set up the attacker for an efficient and powerful counterattack. This will take many hours of perfecting the timing of your block and the connection of your blocking limb to the rest of your body, but once achieved, it will add significantly to your arsenal of techniques. Happy experimenting, and make your practice perfect! Acknowledgements: All Photos were taken by Swanson. Many thanks to Gabby and Cameron for posing for photographs.